I had the pleasure and privilege of meeting with Dr. Peter Klatsky, Director of Fertility Preservation at Spring Fertility in San Francisco, CA. Dr. Klatsky is a leading fertility specialist and innovator with a commitment to improving public access to the best possible obstetric and fertility care. Dr. Klatsky and I spent time discussing fertility issues both in the general public and the veteran population. It was an eye opening experience to learn about the cutting edge science that Dr. Klatsky and his staff use and to gain a deeper understanding about fertility challenges and treatments. Although fertility challenges span every population, there are special considerations when it comes to veterans. With these most recent wars in Iraq and Afghanistan there has been a dramatic increase of 350% in genitourinary trauma as compared to other conflicts in the 20th century. It is estimated that these injuries make up 13% of combat injuries for those who served in Iraq and Afghanistan. Contributing to this steep uptick are advances in battlefield medicine which have increased the likelihood of survival from complex traumatic injuries and a different battlefield landscape from what we’ve seen in previous wars, with Improvised Explosive Devices (IEDs) playing a much larger role than ever before, increasing the risk to these vital areas. It is important to recognize that the majority of those sustaining these injuries are between 25 and 35 years old and many of these service members have dreams of starting or continuing to expand their families. Not being able to do so due to injuries sustained in service can be absolutely devastating. For some, reproductive technologies like in vitro fertilization (IVF) may be the only hope, but the procedure is expensive, running upwards of $10,000 for every attempt. When discussing this with Dr. Klatsky, he explained that on average, it takes four IVF attempts for a successful result. That is of course an average and for some it can take many more tries to result in a successful pregnancy. In January 2017, legislation passed to allow the VA to offer IVF services to veterans with “service-connected disabilities that result in infertility.” This benefit extends to spouses and also covers adoption expenses. In addition to IVF, the VA covers certain therapies such as hormonal treatments, artificial insemination, counseling, and surgical corrections. 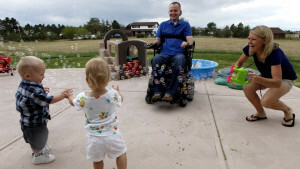 Although the VA does cover certain therapies for those with service-connected disabilities that result in infertility, there are still gaps in the legislation. For example, VA doesn’t cover surrogacy or outside donors for IVF and offers virtually nothing for women who cannot conceive or carry a child due to their service. It is also important to note that there has been very little research and attention given to female infertility and the impact of service on reproductive health from burn pits and other toxic exposures, in part because those injuries are more difficult to prove than those of their male counterparts. As more and more women deploy and return from Iraq and Afghanistan, it would behoove the VA to improve access to treatment for their reproductive injuries sustained in combat. The lack of inclusive fertility care for female veterans further highlights the deeper issue of barriers to care for female veterans. This is an example of why IAVA’s groundbreaking campaign She Who Borne the Battle, to fully recognize and improve services for women veterans is important now more than ever. It is refreshing and encouraging to know that there are amazing fertility resources available, like Spring Fertility that veterans can seek care through if they aren’t interested in or don’t qualify for VA care. IAVA is fortunate to have someone with the amount of experience and expertise as Dr. Klatsky as an ally to consult with on fertility and the latest medical advancements available.